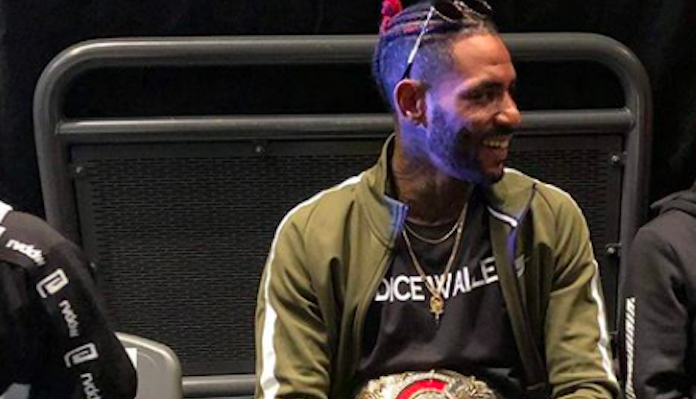 Bellator bantamweight champion Darrion Caldwell traveled all the way to Japan on his quest for a second world title, as we was booked for a RIZIN 14 bantamweight title fight with Japanese star Kyoji Horiguchi. Early on this fight, it looked as though Caldwell might succeed on his transpacific mission, as he was able to take Horiguchi down and control him on the canvas. Mid-way through the third round, however, Caldwell found himself locked up in a Horiguchi guillotine choke, and after a brief struggle, was forced to tap out. While this is not the outcome Darrion Caldwell planned, he seems to be taking the setback in stride. Post-fight, the Bellator bantamweight champion took to Instagram, where he issued a quick statement at the loss, and hinted at a future rematch in the Bellator cage. This loss to Kyoji Horiguchi marks the end of a four-fight win-streak for Darrion Caldwell. The Bellator bantamweight king is now 13-2 overall, and as he says, he’s still definitely one of the best in the world.